The 809 square feet (75 square meters) apartment is situated in a quiet street parallel to the boulevard Saint Michel. It is a few steps away from the Luxembourg garden, the Pantheon and the Latin quarter. It was totally remodeled in 2007 and enjoys a nice terrace on a private courtyard. It is on the second floor of a XIX century building (third floor american) with an elevator. The apartment consists of a large living room with two day beds (normal size single beds), a fully equipped kitchen, a bathroom and separate toilet, one bedroom with queen size bed and a second bedroom with single bed and office corner. The whole apartment is fully decorated in the neo classical style with a lot of period (early XIX century) furniture, paintings and fixtures. It comes with a computer and printer Wifi . Please be aware that to confirm a reservation we ask about 20 per cent of the payment. if full payment is asked you should be extremely suspicious and call the owner on the phone number which is listed here. this property is only proposed on vrbo and homeaway. Carlos Pena Plaza , I am an architect and a historian . I live part of the year in Paris. We loved staying in this apartment, great location and perfect Parisian vibe! Would recommend and stay here again! This lovely place would not be everyone’s cup of tea, but it was ours because to step back into the romantique, erudite Paris of the past — with most of the conveniences of the present , certainly the mist important ones — this was the goal. Close to the Cluny Medieval Museum and just blocks from numerous shops, restaurants, with incredibly convenient bus line access (more than Metro) in this specific locale. Very pleased. Thank you for sharing your home. We loved the apartment. I had been to Paris twice before and my hotel rooms were so small that I couldn’t even fully open the bathroom door without hitting the bed. We especially liked Being within walking distance of so many attractions. I loved this apartment, but . . . The apartment itself is magnificent. 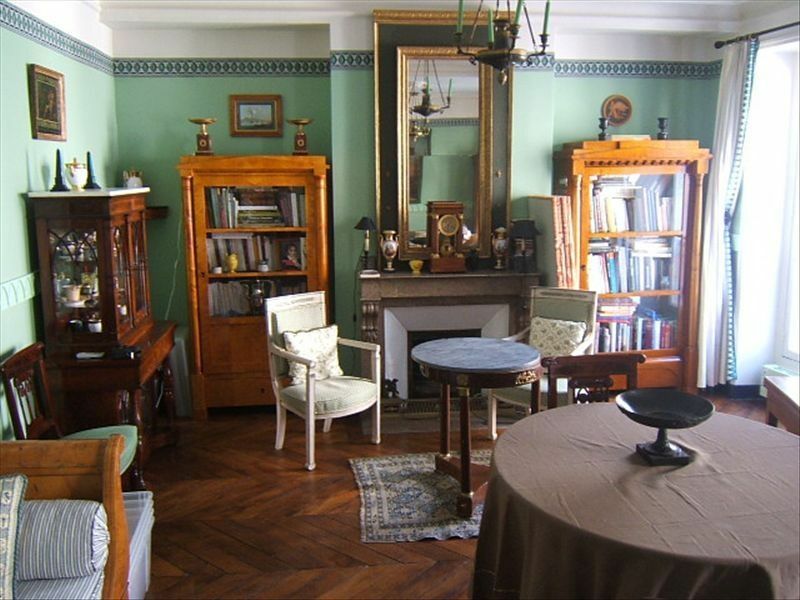 It is in an old, classic Parisian apartment building and it is furnished beautifully with antiques. The location was perfect, just close enough to the Latin Quarter to provide easy access but just far enough from the center to be quiet. The kitchen and bathroom worked well and were very clean. The front room looks out on the street from a French balcony, while the bedroom faces a quiet courtyard. The Val de Grace neighborhood is charming, and the metro stop (including train to the airport) is one block away. You can easily walk down Boulevard St. Michel to the Pantheon, Sorbonne University, Cluny Museum, Place St. Michel, and across the river to Ile de la Cite (Notre Dame, etc.). A few observations: this apartment doesn’t work well as a 2 bedroom for adults, and it is my understanding that children are not permitted (which is reasonable given the antiques and glass fronted book cases). It is really a one bedroom with an office that has a daybed. One must walk through the office to get to the bedroom and vice versa. Thus, each time someone from the bedroom walks to the bathroom or the rest of the apartment, the person sleeping in the office is disturbed. Additionally, there is no door on the bedroom (there is a beautiful curtain), so those in the bedroom don’t really have privacy either. Keeping that in mind, it is a fabulous place for a single or couple. As to the terrace, it is actually a wide wooden ledge that is covered with large potted plants on a drip system. There is no open space and no table or chairs. I wasn’t looking for a terrace so this didn’t matter to me. Given the factors above, if you want to feel you are living in an authentic French apartment (think of the movie “Midnight in Paris”), this is the place for you. This guest did not look at the plan of the apartment posted online or read the house instrucions carefully.We do accept children by the way.You should keep in mind that you are sharing a private home and you could make an effort to adapt for a few days to the owner's taste and sense of style .What you should enjoy is precisely that the place offers a unique experience of old Paris I am afraid that this guest missed the point . We stayed for 6 nights in this special apartment. Very quiet and friendly neighbourhood, the metro station is less than 5min. walk. Close to the Sorbonne, luxembourg garden and to the pantheon. Saint Michelle is about 10 min. walk, so for us it was ideal. The apartment itself is a kind of a small meseum, furnitured with an artistic taste and simply beautiful. Very clean and spacious. The only thing i didnt like was the bathroom having no window, but it is highly recommended if you are looking how to escape the dull, spiritless rooms in boring hotels. My mother and I really enjoyed our stay at this property! The apartment was lovely and full of interesting antiques and books. Even without air conditioning we were comfortable with fans and open windows at night even in hot July weather. The apartment is located on a nice and quiet street, even on the night that France won the World Cup! Very nice location within walking or metro distance to major museums and attractions.